The Victorian Home Museum contains many treasures, not the least of which is the house itself. A. D. Barnum, a building contractor whose local projects included the Iowa Soldiers’ Orphan Home (later the Iowa State Normal School and now University of Northern Iowa), built it in 1861. Barnum lived in the house until 1874. William Bryant, who occupied it with his family until 1919, later purchased it. The final residents, John and Myrna Dempster, sold the house to the Cedar Falls Historical Society in 1966. It has been maintained as a museum since 1968. The Victorian Home is a striking example of the once popular Italianate style of architecture. The interior has been remarkably well preserved. The long windows topped by arches are typical of the Italianate style and are set in walls that are 18 inches thick. The inside shutters (with vertical louvres) are original, as are many of the door knobs and other fixtures. The belvedere atop the Tuscan roof is a Cedar Falls landmark. It afforded an excellent view of the Cedar River when the house was first built, and may also have served as a lookout against hostile Indians. The Carriage House Museum was added in 1991 and houses the Cedar Falls Historical Society's library, archives, and various changing exhibits. 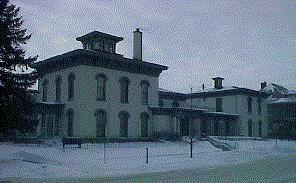 The Cedar Falls Historical Society operates both the Victorian Home and the Carriage House Museum. In 1991, the home was purchased and has been extensively restored. It is a private residence.